Why Does God Give Some People More Than Others? When I tell the story of Joseph and the multicolored coat, from the Old Testament, to young children, they never really get the story. In fact, they never really see Joseph as the hero. Those with younger siblings immediately side with the brothers, and think it’s really unfair Joseph got a beautiful coat and the brothers didn’t. Not only do they approve of Joseph’s brothers selling him, but they express a longing to do the same to their own seemingly more favored siblings. Preschoolers want everything fair and equal. Sometimes, even as adults, we wish everything were equal. We look around and wonder why some people don’t seem to have any trials, or why some people have more blessings than others. We then wonder if that means God loves some of us less than others. As a starting point, it’s always wise to remember that everyone has trials, but those trials aren’t always visible. Many people have trials that are quietly hidden away, and others have trials that appear to be blessings. Some people who unexpectedly became rich, for example, realized that instant and unearned wealth created more problems than it solved, and they’ve given all the money away and returned to their former lifestyle. A great talent that brings fame can cause a person to forget who he really is and to begin to think of his talent as bringing privilege or as being entirely due to his own greatness. Even when we recognize that our trials may be greater than those faced by some others—or at least that their trials seem preferable to our own—we need to remember why we came to Earth. Mormons teach that we lived with God before we were born. This is why He has such a personal understanding of us. He created us and we lived in His presence for a very long time. When it came time to leave home, He told us openly life would come with trials, and the trials would help us to grow and learn—if we allowed them to do so. We’d be free to choose how to view our trials. We could sit and mope and complain about how unfair they were, or we could go to work looking for the blessing in disguise. We could use our trials to stop our lives from progressing or we could use them as a springboard to something better. One person loses his job and sits at home in his pajamas, frustrated, complaining, and angrily churning out resumes. Another seeks a freelance job to tide himself over and two years later finds himself the owner of a successful business. Still another sees a chance to move into a more fulfilling line of work and spends a little time learning what he needs to know. Each person faced the same trial, but two used it to make life better while one used it as a reason to stop being happy. Knowing that trials were a planned part of life and that we agreed to them can help us to gain a proper perspective on trials. They were given to us because God loves us. He loves every one of His children equally, just as good earthly parents love all of their children. Some of our trials might have been assigned to us, but others are the result of man-made choices. Sometimes we’re the victim of choices others made, and sometimes we make our own trials. To take away the possibility of suffering from man-made choices would be to rob the Earth of agency. We’d be mere puppets. Trials are frequently natural consequences of our choices, rather than specific punishments. And so, you have a child who is poor, not because she did anything wrong, but because her father dropped out of high school and has been unable to find a good job. The child had no control over the choice and pays the price for the decision of the parent. She wasn’t placed in this home because God loved her less than the child he placed in a wealthier home. God did give her the right to make choices in her life that can help her overcome or even benefit from her father’s choice. She can choose to learn from his mistake and finish her own education. She can learn to live frugally and to discover life can be joyful even without having a lot of material possessions. When she is in high school, she can decide to encourage her father to go back to school as well, and they can study together. Or…she can choose to grow up angry and resentful over her modest circumstances. She will be poor either way, but one way leads to growth and happiness, while the other leads to sorrow and wasted opportunity. The wealthier child might never know what it’s like to be hungry or to watch longingly while another child enjoys a brand new bicycle, but her parents might spoil her, causing her to grow up without learning to appreciate what she has, or even to work for it. Again, she faces a trial that was beyond her control, but as she gets older, she can make a choice to change. She can decide to share what she has, serve others, and live more simply in her own home. Or…she can just continue to be spoiled and demanding. Neither wealth nor poverty is automatically blessings or curses. Each one comes with its own challenges and opportunities. The final result of their impact on our lives is up to us. We always have God’s love and we can always call on Him to show us how to use both the blessings and the trials we face in our lives. When we pray for guidance we can find out how to approach our trials and even, sometimes, why we have them. By living with a plan and a purpose, we can become everything God knows we can be, and everything He wants us to be. Follow the Leader Reacting To The Waves That Hit The “As If” Principle on Positive Thinking Why Not Believe in God? Its really not so black and white as all that. Do you really believe there are only two options? Complain and be unhappy, or find the blessing in disguise? What if there really isn’t a blessing in a tragedy? What if its just hard? Can’t there be a third choice to choose to endure to the end? I mean, you list three outcomes to your “lost his job” scenario…what about the man who does remain positive and STILL can’t find work? And then loses his house, and gets injured in a car accident, losing his only means for transportation and incurring thousands of dollars in debt that was covered by insurance (because he had lost his job)? What if in that accident he lost his wife or children? And then he is diagnosed with terminal cancer and dies poor and alone. Sound crazy? I’m quite sure there are people living this nightmare and worse. Life is NOT fair and some people never seem to get a break even when they remain faithful to the end. I don’t think you need to slap smiley face sticker on their pain and suffering. Its not always “choose the right, get a happy ending” or “complain and bring more misery to yourself”. In fact, thinking in these terms puts the “fault” pf experiencing unhappy tragedies on the person themselves, even when its not justified. I have seen way too many people assume that something bad happens to someone else because they weren’t praying “hard enough” or going to the temple once a month, or having FHE regularly…instead of having compassion for the person and mourning their losses with them. I agree that life is hard and unfair, and that we need to try to heal through our tragedies and try to find joy where we can. But that doesn’t mean we can’t be upset, angry, or sad about our misfortunes. God gave us a wide range of emotions to deal with our experiences and we can only heal by allowing ourselves to feel them and have them validated. Bethany, Thank you for your thoughts. I didn’t mean to suggest you could never experience emotions from your trials. 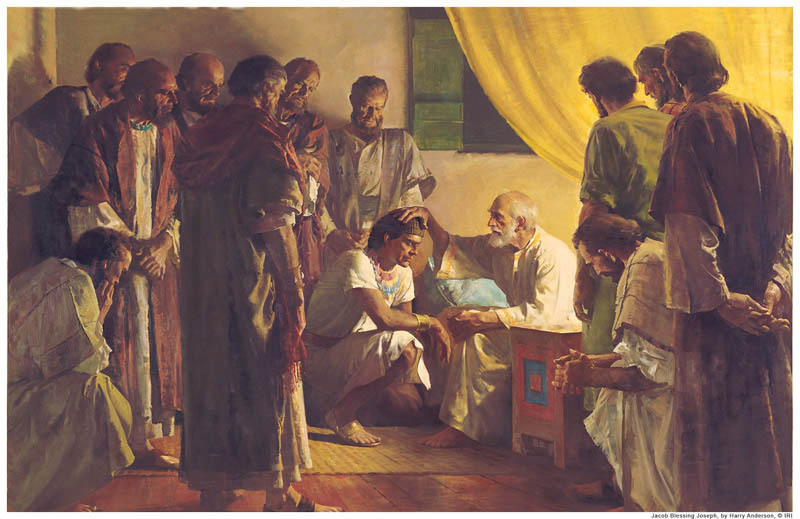 We know that Nephi often suffered unhappiness, but in the end, he wrote that he had been blessed all his life. Most of us wouldn’t look at the life he’d faced, with repeated attempts on his life by his own brothers, as being a blessed or favored life. Job faced trials so severe most of us think we’d collapse under them. Every day, in modern life, people face unbearable trials. Moroni lost everyone he loved and was the only good person left in his world. He was sad, but he held on and continued his work. We can’t choose our trials but we can choose what we’re going to do about them and how we’re going to feel about them. While it’s natural to be sad or angry, to go through the normal stages grieving, it’s not healthy to get stuck in the earlier stages, never coming out into the sun again. However, we have to choose that step. We have to one day decide, “Okay, I can’t control what’s happening, but I don’t have to spend my whole life feeling sorry for myself and I don’t have to give up trying. Nothing in the article suggests your trials are caused by lack of effort or sin. Having lived more than half a century, I’ve experienced a wide range of trials. Some I brought on myself by my own choices, but others were caused by the choices of others and some just happened and were no one’s fault. However, regardless of the cause of the trials, we are responsible for our attitudes and the choices we make concerning those trials. Yes, there is a happy ending for even the most trial-filled life if we endure to the end. When we look at life from an eternal perspective, we know there can be a happy ending if we keep working at it. It may not always come in this life, but this life isn’t the end. I’ve noticed, though, that even the most tried people can be happy in this life if they choose to be. ““And if thou shouldst be cast into the pit, or into the hands of murderers, and the sentence of death passed upon thee; if thou be cast into the deep; if the billowing surge conspire against thee; if fierce winds become thine enemy; if the heavens gather blackness, and all the elements combine to hedge up the way; and above all, if the very jaws of hell shall gape open the mouth wide after thee, know thou, my son, that all these things shall give thee experience, and shall be for thy good. Well i definitely would’ve wanted a love life that so many others were blessed with, which then my life would’ve been completed. Certainly much better than being single and all alone now. I’m sorry! Seeing others live the life you dream of having is incredibly difficult and painful, especially when it comes to love and family. I’ve personally drawn a lot of strength from Ashley Dewey’s “Single Life” series (I’ve linked a particular article, but click on the author and you can read all of her posts), and perhaps you will as well! Wishing you peace and happiness in days ahead.